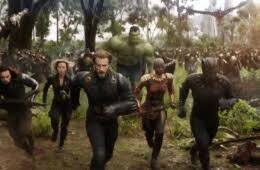 ‘Avengers: Infinity War’ Earns Three Stars: Read the Spoiler-Free Review! Perhaps it’s simpler to say what you won’t see in Avengers: Infinity War. This is a movie, after all, that features large-scale battles on multiple planets, no less than 25 recognizable costumed characters, three strapping golden-haired actors with the first name Chris, a few stolen kisses, a trail of tears and one whaaa? cliffhanger. It’s all there, save for banter between Spider-Man and Star-Lord about Kevin Bacon’s dancing in Footloose. Wait, nevermind. You can check off that box too! Welcome to the ultimate superhero extravaganza. The culmination of a decade’s worth of Marvel Comic Universe films, Avengers: Infinity War is a massively ambitious, thrilling, satisfying, rock ’em sock ’em epic crowd-pleaser to the highest degree. It’s not the best MCU movie ever, not by a long shot. And thanks to Black Panther, it’s not even the best MCU movie of the first half of 2018. (For starters, Part 1 of a two-parter inevitably lacks closure). Still, what co-directors Joe and Anthony Russo have accomplished on the screen is astounding. All the fireworks of summer movie season have been crammed into April. Spoiler: This is a spoiler-free review. I won’t even lean heavily on a storyline description, except to note that it’s blessedly streamlined and easy to follow. All you need to know going in is that the Avengers are still splintered in the wake of 2016’s Captain America: Civil War. Tony Stark/Iron Man (Robert Downey Jr.) remains hesitant about calling Steve Rogers/Captain America (Chris Evans) for help etc. etc.. Also, remember all those much-coveted Infinity Stones? The gems each represent a source of power: Mind, Soul, Time, Reality, Power and Space. A Godzilla-sized alien named Thanos (Josh Brolin), the last survivor of his planet, is determined to collect them all so he can harness this all-encompassing power. His goal: Destroy half the universe’s population with the snap of his fingers. He already has one when the action starts. He’ll have another before the Avengers: Infinity War title card even pops up on the screen. The action is that breakneck. His deadly scavenger hunt serves as the catalyst for all your favorite superheroes to meet each other, form alliances and attempt to stop him. The greatest source of joy stems from these mix-and-match interactions. 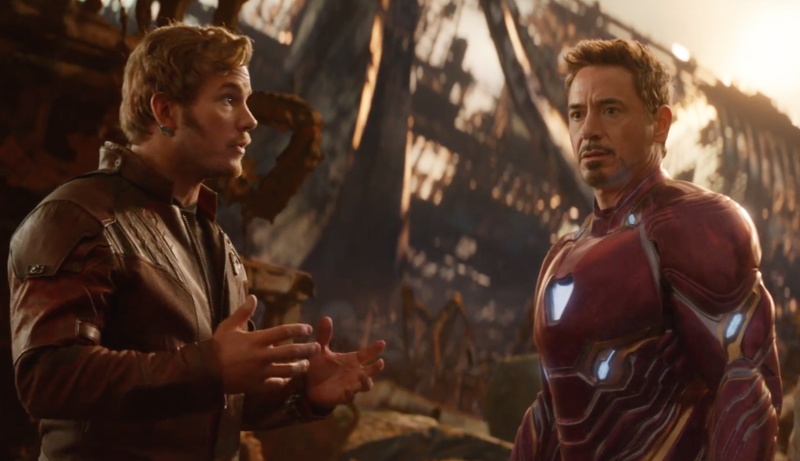 Moviegoers that have followed the MCU since Iron Man in 2008 will no doubt geek out over Iron Man bickering with Doctor Strange (Benedict Cumberbatch) and Star-Lord (Chris Pratt). Peter Parker/Spider-Man (Tom Holland) still idolizes and annoys Stark. There was a big round of applause in the theater when Captain America brought some of his cohorts to Wakanda to enlist Black Panther (Chadwick Boseman) and his partners in heroism (hey, Lupita Nyong’o!). The dialogue during the getting-to-know-you scenes are chock full of clever one-liners, highlighted by Thor (Chris Hemsworth) verbally sparring with the Guardians of the Galaxy crew. By 2025, I do hope the Russo brothers have figured out a way to spin-off a buddy comedy between Thor and wisecracking Rocket Raccoon (voiced by Bradley Cooper). Unlike its D.C. Comics counterpart, Marvel has perfected the comedy-to-action ratio. And no doubt the crackling humor helps make the big heavy set pieces more palatable. There is galaxy’s worth of ground to cover in this 2 ½-hour-long movie, with the superheroes going to war everywhere from New York City to Scotland to Wakanda to a dank, grey planet called Knowhere. The world tour may be catnip those who want their money’s worth of CGI aliens and explosions; I thought the action needed a tranquilizer. You will miss the quieter — and literally down-to-Earth — moments that helped entries such as Black Panther and Spider-Man: Homecoming so enjoyable. There’s scant time here to process the story, the punchlines or the crying. And I assure you Zoe Saldana (Gamora) is an Olympian crier. I promise I haven’t revealed anything. I couldn’t even if I wanted to! Though the upcoming Avengers movie is no longer titled Infinity War: Part II (they were filmed back-to-back), this installment can’t realistically be considered as a complete, well-rounded film. And this “Part 1,” like many before it, suffers because of it. That’s why nothing seems 100 percent decided and final, no matter how dramatic it plays out on the screen. I do wonder how audiences will respond to the end, but that’s a future fun debate for social media. Before the start of the world premiere for Avengers: Infinity War in Los Angeles, the entire cast took the stage at the Dolby Theater. The Guardians. The Wakanda crew. The past/present villains, from Loki (Tom Hiddleston) to Bucky (Sebastian Stan) to Thanos. The original Avengers. The turn-out was so impressive that legit A-listers such as Cooper, Cumberbatch and Vin Diesel (Groot) were relegated to the back row. Downey gave a speech and noted that the assembly of this caliber of talent for a comic book movie was nothing short of “a miracle.” Truth. So let’s commend a movie that manages to maneuver this group like a chess board, give every character a special moment to shine and pay homage to Hemsworth’s biceps. Powerful stuff, indeed.